Godric: Do you believe in God? Godric: If you're right, how will he punish me? Sookie: God doesn't punish, he forgives. Godric: I don't deserve it. But I hope for it. Godric: You'll care for him? Eric? Sookie: I'm not sure - you know how he is. Godric: I can take the blame for that too. Sookie: (smiles) Maybe not. Eric's pretty much himself. 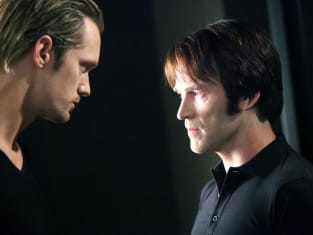 Sookie: Are you very afraid? Godric: No. No. I'm full of joy. Godric: I want to burn. Sookie: I'm afraid for you. She starts to tear up. Godric: A human with me at the end, and human tears; 2,000 years and I can still be surprised. In this I see God. Bill: We may be immortal, Lorena, but you are dead to me. Lorena: I wish you hadn't said that.